But, what is that something they are looking for? Many of them may say: “we want more money, more time, more things.” Of course, common wisdom says that more is better, but is it? Having things apparently is good. Although, when you focus solely on having your vision of the future becomes blurry until you forget what you were looking for. Why do people forget what they are looking for? Mainly due to the lack of a philosophy of life. Why should you care about philosophy when the world spins at the speed of light? I know you may think: “here you go, another philosopher of modern times trying to have me believe that philosophy can have any impact on my life.” Unfortunately, I am not a philosopher, and I am not here to teach you anything about life. What I can do instead is to report history and facts about philosophy and how this influenced generations of successful individuals to become thought leaders. Do we all see in the same way? Are you able to see from different perspectives? Why is it so hard to understand others who think differently from us? What advice would Covey give to you? Why should you follow Covey’s principles? There are two ways to approach life: One way is just go with the flow, do not ask yourself any question about existence and give all for granted. The second way of living would be to ask yourself questions about existence, life and the world around you. In this circumstance, you will look at the world that surrounds you with mesmerizing eyes. You will think of how incredible the feats of nature are. Although you may never know the reason you are here, you can still appreciate life in its entireness. Which one of the two ways of living you think would make you happier? If you picked the latter, then you are for having a philosophy of life, whatever it is. Indeed, having a view of life, it means asking oneself questions about existence and finding your answers. It is not right or wrong but just the way that fits most your way of being. Also, philosophy allows you to have a grand framework. Rather than be like a “candle in the wind” that suddenly moves at each wind’s blow, a philosophy of life makes you still, poised, peaceful, a person of character! How? Well, philosophy gives you life’s principles according to which you will face any situations, small or significant, urgent or not with consistency and rationality. Stephen Covey was born in 1932 in Salt Lake City, Utah. After earning a Bachelor of Science degree in business administration from the University of Utah, an MBA from Harvard University, and a Doctor of Religious Education (DRE) from Brigham Young University. Stephen Covey wrote the “7 habits of highly effective people”. His book became a best seller in no time. The principles stated in Covey‘s book are not his invention but natural laws (Bio). Stephen Covey’s masterpiece “The Seven habits of highly effective people” is the outcome of an in-depth study of success literature published in the US since 1776. Let me tell you the story of two friends of mine. They were twin brothers: Tony and Albert. They had the same parents, they lived in the same town, and they knew the same people. Tony grew up to become the mayor, the person who helped and inspired hundreds of people to improve their life. Albert, instead, became a corrupt individual, he always tried to fool and take advantage of other people. Tony had tried to save his brother Albert, but with no success. I ever wondered how is this possible? If they had the same DNA and apparently the same life experience up to a certain point in their life, how could it be that one became a leader and the other a despicable person? Although both brothers seemed to have experienced the same things they formed two completely different personalities. How is it possible?! The answer to this question popped into my mind when I eventually read Covey’s “7 habits”. I remembered the day when we were kids, at the park. We were all learning how to ride a bike. Tony was excited the whole time, and although he fell many times, he stood up and eventually became excellent at it. Albert, instead, at the first fall, gave up and went home moaning about the fact that he would never be able to ride a bike in his life. Therefore even though they were living the same experience, they gave to those experiences a different meaning. That is the power of perspective! But how was it possible that twin brothers, with the same life, the same parents had such a different perspective on life? I later found out they had different role models. While Tony followed Grandpa Tony approach to life, Albert instead followed Grandpa Al approach to life. It is incredible to me how a name can affect our existence (How much does your name matter?). Although a name just names, we convince ourselves that they embed personalities and for some reasons, we must follow the destiny attributed to it. Tony and Albert believed that names were determining. Since they brought their grandparents’ first names they “had” to follow their footsteps. But what was the difference in life’s approach of Grandpa Tony compared to Grandpa Al? As I later discovered Grandpa Tony had what Covey defines a “character ethic” approach. Grandpa Al instead followed a “personality ethic” approach. Indeed, Grandpa Tony had a framework or principles that guided him through life. For example, Grandpa Tony did not care about people’s judgment. He would only do things based on his wisdom and understanding. Grandpa Al instead, used persuasion techniques. For example, he cared so much about people’s judgment that he would do anything to impress them. Therefore, Grandpa Al would use a different “façade” according to the situation at hand. In the long run, this approach to life created a lot of stress in his life. It should not surprise you though that Grandpa Al died at age 60, with a heart attack. On the other hand, Grandpa Tony lived a fulfilling life, always helping his community. Still today people remember him as a compassionate man, always ready to help. He never let others influence his judgment about right or wrong. Indeed, according to Covey, each has a different map of the world. The effectiveness of your plan will determine how fulfilling your life will be. Imagine you are going from point A to point B and someone gave you a map to reach point B. You walk for few hours around the block, and suddenly you find yourself again at point A. What had just happened? You look at the map, and you realize that point B for the person who gave you the map instead points A according to your perspective. One day I was walking through the streets of Rome. The city is full of history and each step you take brings with it thousands of years of history. In a paradisiacal place like that armory and love should reign. Although this is not always true: one day I noticed an accident amid a biker and a car driver. Fortunately, they were both fine. Nonetheless, they were animatedly arguing about who did what. The biker would say: “you passed with red light” and the car driver would reply: “you were going at 60 on a 35-speed limit street!” And this was going on for many minutes while traffic on the road was building up. The hilarious part is that when I got back from my walk (over one hour after), they were still arguing. Also, due to the accident, there was a traffic jam, and the cops could not seem to stop the two people arguing over who was right or wrong. Of course, they were both right and both wrong. The biker was right in saying that the car driver passed when the light was already orange but he did not admit that he was speeding up. On the other hand, the car driver was right about the biker speed, but he did not acknowledge that the traffic light was going red. At that moment I realized how vital is perspective! In many circumstances, there is no right or wrong but different angles at which you can look at a particular situation. Why then, we don’t use different perspectives to understand each other better? It turns out that is not easy, and it implies what Covey calls a “paradigm shift” (term used by Thomas Kuhn in The Structure of Scientific Revolutions). Think what happened in the 16/17th century, when people believed that the earth was at the center of the universe. Of course, they were not wrong if you considered their perspective. They were looking at the world through their senses. They could see that the stars in the sky looked like small dots. Also, they could not feel the earth moving beneath their feet. Therefore they assumed that the earth was static and the sun moved around it. Even when Galileo Galilei introduced the telescope, and it was clear that the earth was not at the center of the universe people still couldn’t see! Why? Because to see they had to change their perspective, they had to shift their paradigm. Everything they believed up to that point was wrong, and they could not accept it. It was easier for some people to think that something wrong and they live their lives in ignorance rather than accept the truth. But how can we shift paradigm? One way would be to challenge our assumptions about life. If you catch yourself always thinking to be right, this may be a signal. Shifting paradigm and developing a better understanding of the world around brings us to the next concept: dependence toward interdependence. One of the main reasons for this misinterpretation is due to our habit of looking for an answer outside of ourselves. We tend to think that the problem is always somewhere else. This leads to what Covey calls “dependence.” Covey discriminates between three kinds of persons: “Dependent people need others to get what they want. Independent people get what they want from their effort. Interdependent people combine their efforts with the efforts of others to achieve their greatest success”. Therefore, Covey’s seven habits is a path comprised of 6 habits that will get you from dependence to interdependence and the last practice to spin, rinse and repeat. The first three habits are proactive, begin with the end in mind, put first things first will get you from dependence to independence (private victory). The last three: think win-win, seek first to understand then to be understood, synergize will get from independence to interdependence (public victory). The last habit “sharpen the saw” is about renewing oneself periodically. As a human being, you can redirect and control your impulses. When a stimulus comes in your way, you don’t have to respond right away. Quite the contrary, you can become aware and then answer. When you increase the gap between stimulus and response that is when you develop “freedom to choose.” The control over your impulses is crucial. Indeed, in the late 1960s and 1970s Stanford psychologist Walter Mishel tested what is called “the marshmallow experiment.” In this experiment, a marshmallow was given to kids in an empty room with no games or distractions. Thereby focus is crucial. If you will focus most of your time watching TV and moaning about the global economic crisis, the wars, the government and soon you will become a miserable person. If instead, you will put most of your effort on family, work, friends (all the things on which you have influence) you will be way happier. How to start working in your area of control? Change your bad habits into good ones. Determine which kind of person you want to be and act upon that (work on your be versus have). Take a deep breath, clear your thoughts and let’s get ready for a practice that will change your life. Imagination is a dominant force in our life, and if you never used it, it is time to start. Let the past go and start molding your future. Let me ask you this: do you have a vision for your life? Don’t you? Realize that you are building a house without a project, how long you think it will last? Therefore it is time to find your vision. How? Picture yourself on your death’s bed. What are the things that you would regret the most about life? Once found out go on and act upon them. Let me tell you an incredible story: in early 1990s Internet phenomenon was just starting. New companies emerged and by the end of the decade the only fact that a company was including in its name .com would make its market valuation skyrocket. In 1994, Jeff was a Wall Street guy. After graduation from Princeton in computer science and electrical engineering, Jeff landed a job on Wall Street. His career in Wall Street was pretty lucrative. One day Jeff was surfing the web, and he was stunned by a statistic about Internet usage. According to this statistic, Internet usage was growing at a staggering 2,300% per month! At that moment Jeff had the “Eureka moment”: he wanted to start his own web company. If you did the exercise described in the previous point, you should have now a clear vision of where your life is headed. You created the project of your life. Now it is time to build upon it. Start doing things that will get you closer to your vision. How? 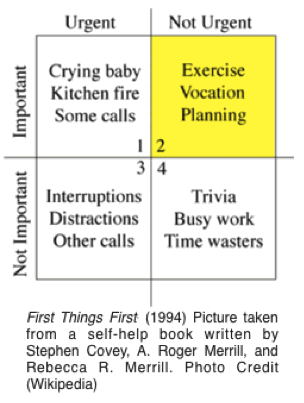 Stephen Covey offers a fantastic tool called “the management matrix.” Covey discriminates between two group of things: the important or not important and the urgent and not urgent. Can you guess why the second quadrant has been highlighted? Because this is the Quadrant where you must focus the most. Indeed, if you spend too much time in Quadrant I you will burn yourself out. If your focus is in Quadrant III and IV you will end up being entirely dependent on others, your life will be worthless and futile. If you instead organize your agenda around Quadrant II, this will give you vision, perspective, balance and so on. Start now to reorganize your schedule accordingly. You can see a sample at this link Covey’s weekly worksheet. This stage will have you develop the habit of cooperation. 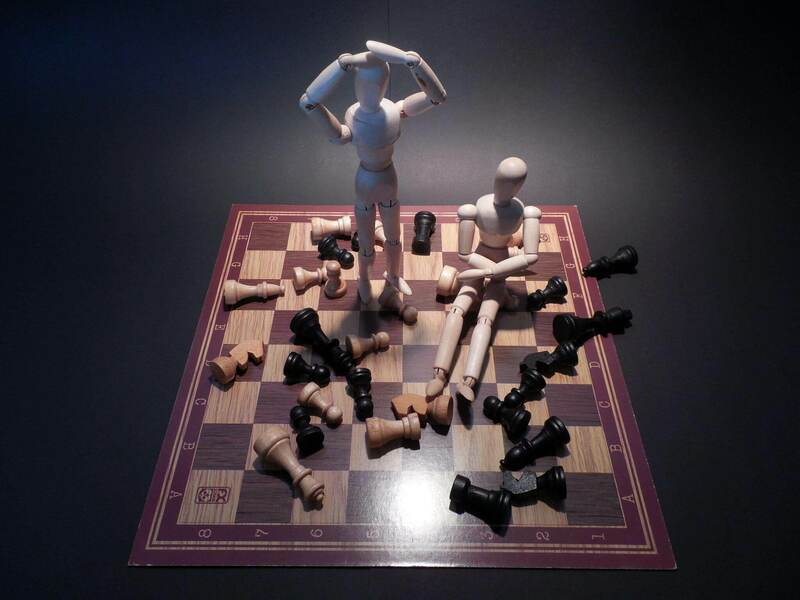 If you are not familiar with negotiation, check out William Ury Getting to Yes. This Habit is about “stopping to use techniques and start using empathy.” There is no way you can build a long-lasting relationship in life and business if people around you sense duplicity. (Getting to Yes with Yourself – William Ury). This is really about trying to understand people who think differently compared to you. One right way to practice this Habit is to think of a person that freaks you out. Found it? Imagine having a pleasant conversation with that person, and agreeing with him/her. You must not fake it but feel how that person feels, internalize his feelings until you can finally know that person for the first time. If you do so according to Covey, you will go from transactional to transformational relationships. Be ready to renew yourself periodically. Let me tell you another story. I cannot promise the last I will say since I love stories, but I will make it short. I know a person who worked very hard all his life long to reach all the objectives he had. Since childhood teachers told his parents, he would not be able to be as good as his older brother, and he was doomed to mediocrity. The problem was that our friend did not like school and did not see value in things he was learning there. Although one day as a kid he realized that he had to be successful in school if he wanted to reach his goals in life. Therefore, he went on, earned his master degree in Economics and an MBA from a prestigious European university. Considering that this person was coming from a poor family, it was a great achievement. Not happy though he pushed further until he got a job in California for a valuable tech company. He worked his tail off until he was promoted to become a manager at a very young age, the first European manager to earn such honor. I cannot tell who this person was but when I asked him: “how did you make it?” He surprisingly confessed: “When I was just seventeen I found, by chance, a copy of Covey’s book, and it became my bible. I never stopped implementing the seven habits throughout my life!”.